Gran Canaria - great for a family holiday We decided to take the family off for a jaunt to Gran Canaria for a family holiday this year; it was the first time the children had flown, so we thought it all be a good adventure. Wow, what a week it was, have any of you been to Gran Canaria before? It's a great place to go. We went during the Whitsun half-term, and the temperatures got up to 38 °C. As The Sun may well put it - phew, what a scorcher. We didn't venture very far from the hotel we stayed in, which was the Hotel Orquidea. The nippers were more than happy playing in the pools, and on the beach; so why bother to go anywhere else. The only time we did venture off, was to have a day at the Aqualand water park. This too was a great place to visit, and the kids were happy all day. 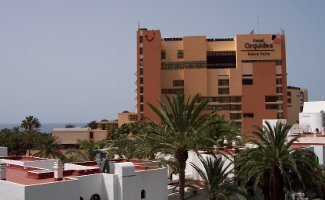 Hotel Orquidea - the all-inclusive hotel we stayed in If you're thinking about an overseas family holiday, and you want a bit of sun, Gran Canaria is well worth a look - especially if you're planning on going at a time when you're not guaranteed the sun at many of the other Spanish resorts. Although the Canary Islands (of which Gran Canaria is one) are Spanish, they are actually located just off the west coast of Africa, which is why they have a fantastic temperature year-round.